UFC is entering into a new era as they’re making debut with its new partner ESPN tonight (Sat., Jan. 19, 2019) with a new legacy championship belt on the line. 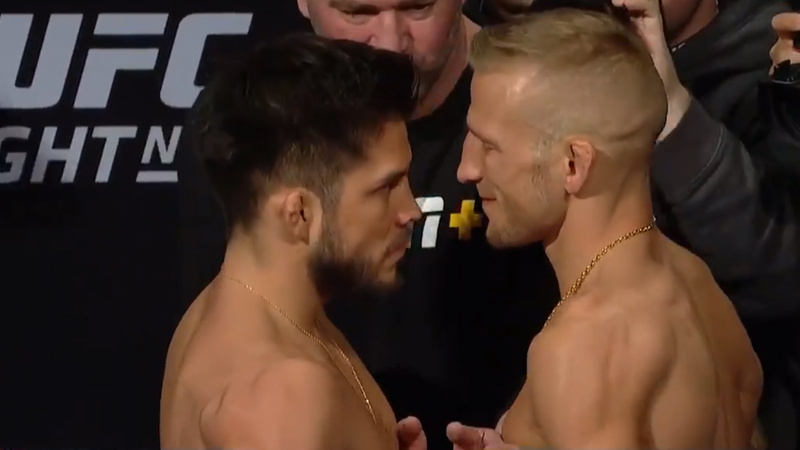 Tonight’s UFC Fight Night 143 event headlined by flyweight title fight where division’s champion Henry Cejudo looking to defend his crown against current bantamweight champion TJ Dillashaw who moved down in weight class in a hope to become the fourth “champ-champ” in UFC history. In the co-main event, controversial NFL player Greg Hardy is making his debut in a heavyweight fight against “Tuesday Night Contender Series” veteran Allen Crowder. The main card begins with a lightweight bout between Gregor Gillespie and Yancy Medeiros, a flyweight fight between Joseph Benavidez and Dustin Ortiz, Paige VanZant vs. Rachael Ostovich will clash in a flyweight bout, and last Glover Teixeira and Karl Roberson square off in a light heavyweight. How do you watch #UFCBrooklyn? The preliminary portion of the event starts with a lightweight bout between veteran Donald Cerrone and Alex Hernandez. UFC on ESPN+ 1 preliminary card starting at 6 p.m. ET, followed by the ESPN Preliminary card at 8 p.m. ET, then the main card start time at 10 p.m. ET on ESPN+. If you’re in Brooklyn, you can buy tickets at Ticketmaster.com. Or if you don’t have access to the city fight fans, can sign up a seven day trial of ESPN+ here.